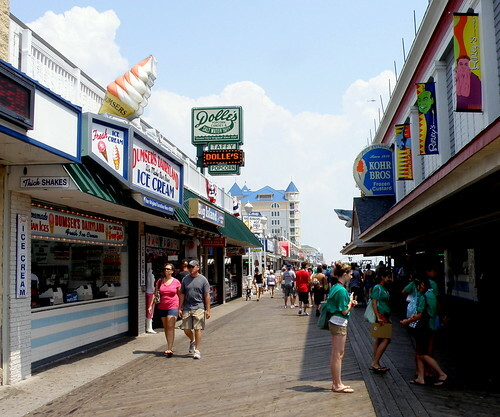 Dumser’s has been a part of the history of the Ocean City Boardwalk since 1939 ~ Dolle’s Candyland specializes in homemade salt water taffy Since 1910, originally uploaded by Robert Lz. As a kid I loved Ocean City, MD. I remember scarfing down buckets of Fisher’s popcorn, Dumsers ice cream, chocolate strawberries from Candy Kitchen (what can I say, I was a hungry kid), then immediately racing off into the waves only to return 5 minutes later with a massive stomachache, and a craving for more popcorn. We’d run around all day and stop by the Gocart track on the way home to race off any excess energy before the long, slow trek home bumper to bumper with the other day-trippers who were too stingy to stay in a beachside hotel. Also the attendants of the Ocean City rides really need to ease up on the Drakkar Noir. Maybe there are hidden gems of the city that I haven’t experienced? But for now I’d pick Rehoboth, Assateague, hell even Dewey, over OC. What am I missing out on?